One of the perks of studying geoscience with the Open University is it has a very active Geological Society. Although I joined and went to the odd talk towards the start of my degree, as with many other things, life gets in the way. When I heard the speaker of April’s meeting though it was impossible to not jump at the chance to go…. On my trip to Masaya back in February I had the privilege of working with John Murray, Visiting Research Fellow at the Open University. A geophysicist, he has worked predominantly on Mount Etna for over forty years. In that time monitoring techniques have moved on greatly, as has much else with the development of technology. This however does not mean proven techniques are not equally, and in some cases, more effective than the new. John specialises in leveling, dry tilt and more recently GPS monitoring of Etna which gives us high precision ground deformation data. For years John secured funding from NERC and many other sources to map the volcanoes deformation. In later years research has become self funded such is his drive to discover the inner workings of the Mediterranean giant. Figure 2. A map showing the volcanoes of Italy. 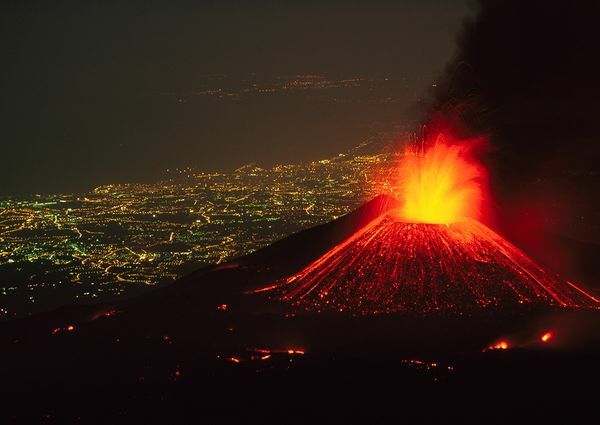 Etna is the only one laying of the island of Sicily. Figure 3. John levelling on Masaya. The other night John addressed the London branch of the Open University Geological Society (LOUGS), to tell them about his work and what he believes 45 years worth of data suggests. Etna began to erupt roughly 300,000 years at the Val Calanna centre south-west of current activity. Subsequent activity moved on to theTrifoglietto 1 and the Trifoglietto 2 centres before its current position about 170,000 years ago which is sometimes refered to as Mongibello as depicted in figure 4. The Valle Del Bovo is a prominent feature on Etna. The U-shaped depression many believe depict structural failures of the flank along the line of migration of volcanic centres. What John has suggested based on his high precision mapping is that it is not the magma source that is moving but the topography which is slipping seaward. 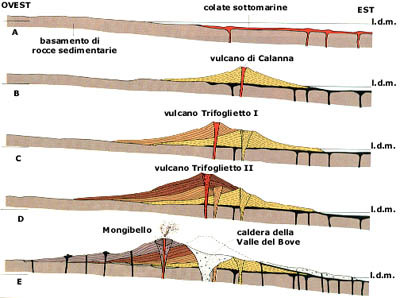 Also as ground deformation does not following Mogi models (a mathematical model which links changes within a magma chamber to topographical changes), it is being suggested that Etna does not have an appreciable magma chamber, rather taking its material straight from the mantle like a hot spot. This idea is chemically supported by the fact the main igneous rock produced by Etna is Hawaiite; which is compositionally similar to mantle rock. John is yet to publish his findings in full so I won’t give away any more. It’s safe to say though it is sure to change our views of Etna’s dynamics. John’s passion in his quest to uncover Etna’s secrets is truly inspirational, especially to an aspiring volcanologist like myself. I can’t wait to work on her flanks with him next August. Figure 5. Eruption February 23rd 2013.